Breaking with EU and US, Israel remains ambivalent after Spain asks Israel to come out against Catalan independence. Breaking with the stance of other Western countries, Israel decided on Monday not to express an official opinion on the issue of Catalan independence in the meantime, NRG reported. According to the report, Spain asked Israel over the weekend to publicly declare that it does not support Catalan independence, as part of Spain’s efforts to garner international consensus on the matter. 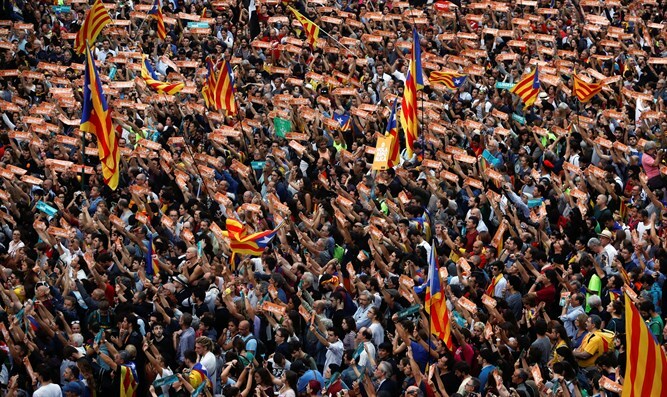 According to NRG, the reasons for Israel’s move are twofold: First, Catalonia is seen as a pro-Israel region, with Israeli flags a common sight on Catalan homes - notwithstanding the Barcelona municipality’s recent adoption of BDS measures. On the other hand, officials quoted by NRG noted that Israel has also not expressly sided with Catalonia, likely so as not to pay a price for departing too drastically from international consensus.